Nice knit socks were and still are required for a warm, dry foot! There is nothing worse than a big hole that your toe sticks out of or one on your heel. In the past, people would not throw away their socks and waste materials, instead they would fix them. A darning egg is a hard, round object that is inserted into a sock while repairing a hole. The darning egg makes it easier to stitch so it's not too tight or too loose. It prevents the sock from losing its shape while you repair and prevents you from accidentally stitching two sides of the sock together. 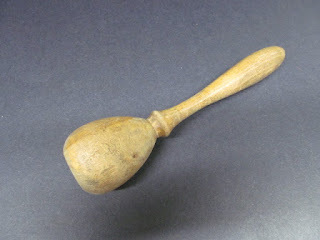 We are very interested in collecting photos or reminiscence of darning eggs. If you have any memories or even a photo or two of your darning egg please e-mail me at stephanie@heritagefoundation.ca or call 709-739-1892 ext. 3 or toll free at 1-888-739-1892 ext. 3. I would love to hear from you!